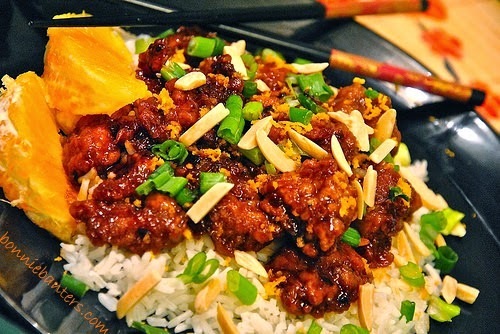 Do you ever have a craving for orange chicken...like Panda Express'? I love their orange chicken; so when I originally found this recipe on the internet, I was excited to make it. Though I wouldn't say this is exactly like Panda Express' orange chicken (as the original recipe suggested), this Asian-inspired chicken is sure to satisfy your craving with its crunchy tempura-like batter, true orange flavor and crispy green onion and toasted almond toppings. With this recipe, you can enjoy orange chicken takeout at home by taking it right out of your own oven with easily accessible ingredients. Panda Express' orange chicken does have a little more heat than I like, so I adjusted the amount of red pepper flakes from the original recipe. Of course, if you prefer more heat, you can add more red pepper flakes, or you can just omit the red pepper flakes altogether. Like I generally do, I made quite a few changes to the original recipes...including increasing the orange flavor with the addition of navel orange pieces. I preferred the more obvious flavor of navel orange pieces over mandarin orange segments. As I typically do, I've tried to eliminate any guess work and be as thorough as possible with the directions. I often say that I write a recipe as though my daughter were standing beside me. I Took It Out Of The Oven! I like to give credit when I find a recipe and adapt it. I originally found this recipe on babble.com a couple of months back; however, the actual recipe I found is unavailable as of today. I did find another recipe on babble.com; and though it appears to be the same, it is a different author. I made quite a few changes to the recipe I originally found. Zest and set aside one of the oranges for the garnish before you separate into segments. The original recipe called for 1 TB dried, crushed red pepper flakes...Panda Express' orange chicken is rather spicy...so I suggest beginning with the 1 tsp. I recommend and add more if you like. I think the 1 tsp. I recommended offers a little palatable bite for most. Naturally, you can omit the red pepper flakes altogether, if you prefer. When using the honey, spray your cooking utensils with a butter-flavored cooking spray for easy release. Pat the chicken breasts with paper towels, and cut into about 1" to 1 1/2" bite-size pieces. In a medium-sized bowl, whisk the eggs well with the milk. In a separate medium-sized bowl, using a fork or whisk, stir the cornstarch, salt and pepper together. As the pieces fry, transfer to a paper towel-lined baking pan or dish and allow to cool. While the chicken cools, Preheat the oven to 400º and prepare the sauce. In a 1 qt. saucepan, whisk together the soy sauce, ketchup, honey, orange juice concentrate, white vinegar (optional), chives and red pepper flakes (optional). Bring just to a boil, stirring occasionally, then remove from the heat. In a large bowl, toss and thoroughly coat the fried chicken pieces with the glaze. Arrange in a single layer on a (preferably non-stick) large, rimmed sheet pan, at least 15 1/2" x 10 1/2". Bake for approx. 15-18 minutes...turn the pieces over after about 10 minutes to completely coat with the glaze. Prepare The Garnish while the chicken bakes. Remove the chicken when the glaze is no longer puddled around the pieces, but be careful not to over cook. The chicken should be sticky and fully coated. Transfer from the oven to a serving bowl or dish and stir in the orange pieces. Sprinkle with the remaining garnishes: the green onion, red pepper flakes to taste (optional), orange zest and slivered almonds. Serve immediately over sticky rice. Refrigerate leftovers. Freezes well...freeze in individual portions and reheat on 50% power about 3 minutes. What...so now they want fortune cookies? Enjoy! We love orange chicken but we consider Panda Express fast food, even though it is soooo good. This recipe looks awesome and healthier, love it! Well, I wouldn't call it fast...Lol! Glad you like it Matt...enjoy! I'll have to try the cornstarch in some French toast...thanks for tip! Look forward to your ginger dip! Oh my goodness! I love orange chicken but I haven't had it in a very long time. I want to make your version, asap! Thank you for sharing, sweet Bonnie!